Once upon a time (last fall), I reviewed some really great iPod Touch apps, that also work on iPhones and iPads. I promised to review more of them. Seven months later, I'm getting around to doing it. In my defense, we were playing with the next three, I was just about to review them, and my iPod vanished while sitting at a table where the kids were selling Scout Popcorn. I didn't want to review it without actually being able to pull stuff up. And a few weeks later when my iPod reappeared, well, I was too busy getting other things re-figured out and basically, ummm, I forgot. So, without further ado, here are my thoughts on three more of the math programs put out by iHomeEducator -- iLiveMath Speed, iLiveMath Trains, and iLiveMath Farm Fresh. 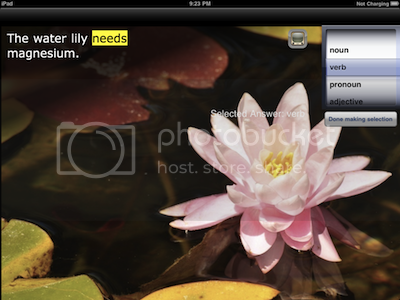 And also something new: a grammar program, iLiveGrammar Botany. Sometime in the next week, I'll review the other three math programs that I own. I'm eying some other products of theirs now too, as they have branched out into spelling and history. 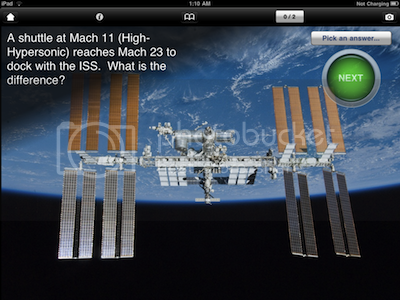 The basic idea is that each app has a theme, and there are amazing photos in the background of each page. Each app has three levels of increasing difficulty. As you work through the problems, you get a little "wheel" to roll to the correct answer, so it isn't a multiple choice thing. The wheel does limit your answer choices some, so it is possible that a child could completely mess up the calculation and figure out that they were totally off base when they pull up the scroll wheel to answer it. But that is far better than having to scroll through hundreds of numbers. Level 1: Addition and Subtraction, with problems like: "The freight train has 7 railcars of coal and 4 of goods. Calculate the total railcars." Or, "A maglev train had 9 scientists and traveled to the next depot to pick up 2 and drop off 10. How many are on the train?" Level 2: Deals with addition, subtraction and multiplication, using weight, currency and speed. This has questions such as, "If a steam train voyaged at 28 km/h, how many kilometers are traveled in 3 hours? (km = km/h x hours)" and "The freight train has 11 railcars of fuel. If each loaded railcar is an average 130 tons, what is the total weight hauled?" This level also consists of more complex problems like those in Level 1. Level 3: the same types of problems as in Level 2, but more advanced. 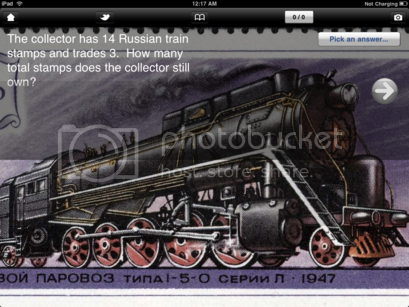 Problems include: "The philatelist has 59 German maglev stamps and barters 1 for 66 Chinese stamps. How many total stamps does the philatelist still own?" or "If a maglev train traveled at an average speed of 213 mph, how many miles are traveled in 9 hours? (Distance = Rate x Time)" I'd love to require my physical science students to work this level and email me with their results. iLiveMath Farm Fresh: This program involves gorgeous photos of produce and it makes me hungry. It also bills itself as including science and reading. This would be a great choice if you have younger students, as level 1 is significantly easier than some of the other versions. 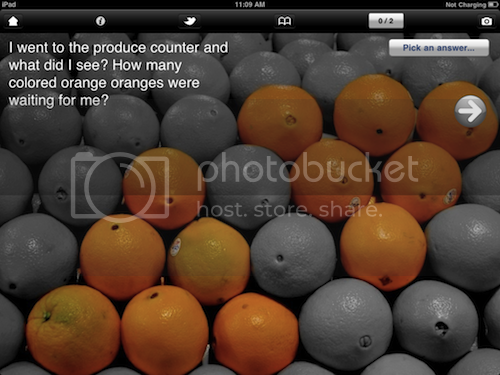 Level 1: Beginner Level Counting -- this one integrates the photos... so a picture will have seven apples, three are green. The question is "I went to the orchard stand and what did I see? How many colored green apples were waiting for me?" The screen shot here is the biggest number I saw. Level 2: Uses "Stone Soup" to teach addition. The level starts off with the "Stone Soup" folktale in a textbox, up to the point of "Of course, it would taste so much better if it had some vegetables... so..." and then you can do the math. Questions are all along the lines of, "Into the stone soup the policeman put in 4 radishes and the old woman put in 6. How many radishes were put into the soup?" On my iPod Touch, some of the questions cut off. For instance, "Into the stone soup the engineer put in 7 fresh tomatoes and the doctor put in 6. How many fresh tomatoes were put into the" and apparently, underneath the picture of gorgeous tomatoes, is the word "soup?" Not a big deal, as the number needed are always there. And if I flip to landscape, the words all appear. Level 3: agriculture problems. This has questions like, "There are 12 pints in a flat. If one flat contains 2208 blackberries. How many blackberries are in 9 pints?" or "At the produce counter, one bushel of lemons contains ~37 lbs. if there are 4 lemons per pound, how many lemons are in one bushel?" Obviously, some of the grammar of these computer generated questions is a little off, but honestly, that does not bother me. This program also has YouTube videos on various farm-related topics, like tractors or aquaponics. Love this app, particularly that I can have Trina successfully use one of these. Most of the programs frustrate her because the addition is just a little bit too advanced in level 1.
iLiveMath Speed: This is probably my favorite iLiveMath app of them all. If you are going to try a single one of their products, and none of the subjects particular screams at you, then try this one. This one is all about fast "stuff" like rockets, trains, planes, and race cars. Level 1: Addition and Subtraction, with problems like: "A lead pack of 21 Formula One racers drafted in a line and as they rounded a turn 11 hurtled ahead. How many are left behind?" Level 2: Deals with addition, subtraction, and multiplication, and uses speed, rate, distance and time. I LOVE THIS LEVEL! There are questions like those in level 1, but also questions like: "At the speed of sound, Blue Angels flew 1 mile in 5 seconds. The jets travel 23 miles in ___ seconds? (Dist. = Rate x Time)" or "The Space Shuttle launch was rescheduled from 11:17 PM to 11:35 PM due to ice. How long did the families wait?" Most of the questions are basic addition or subtraction, but some of these more complex ones are worked in. Level 3: Same as Level 2, just more complex. And more of the problems are distance/rate/time ones. Problems like, "If sailboats skimmed at an average speed of 18 knots, how many nautical miles are traveled in 16 hrs? (1 knot = 1 nautical mile/hr)" or "A Formula One car zoomed at 350 km/h for a 1.6 hour race. How many kilometers did the Formula One car travel?" This program is incredible. These are the kinds of problems that SO MANY students really struggle with. I've seen it with the kids in my "8th grade" Physical Science course, I've seen it with middle/high school kids in so many settings. This may not be the most girl-friendly topic, but it is the perfect way to work on these speed, distance, rate, time types of problems. iLiveGrammar Botany: This one is different. Combining Science with Language Art, this is a great way to learn a bit of botany, including some amazing plant photos, with grammar drill. And beautiful music in the background. Lesson 1: Nouns and Verbs: This lesson deals with nouns and verbs. In the question pictured here, the highlighted word "needs" is the question... you use the wheel to pick the correct part of speech. When you choose "verb", you will get a box that tells you that needs is a verb and that a verb conveys action or a state of being. Lesson 2: Adjectives and Adverbs. Same basic problem types, using adverbs and adjectives. So you are picking out words like regularly, flourishing, naturally and stunning. Lesson 3: Articles, Nouns, Conjunctions and Prepositions. Again, similar style, words like to, and, for, and so on. Lesson 4: Review. This section can contain any of the word types, and is obviously the hardest section. But after working through the first three lessons, this should not be terribly difficult. There are videos with this too, including Schoolhouse Grammar ones. I love that. There are also great botany related videos. The sentences are great, and most do go along with the photo. Each of these apps are available for $4.99. My one issue with all of them is probably mostly my family. My kids tend to be more advanced in math for their grade level, and less advanced with reading. Especially at the level one stage of these, my kids are not able to do the reading necessary to complete these independently. Disclaimer: I obtained these apps through various means and was under no obligation to review anything. I am reviewing these because I love them.